The Home and Personal Care industry only had two applicants. See pie chart. Swedish companies make 33% of the applications. Poland comes in second place with 21% and Finland and Lithuania share third place with each 9%, while a smaller percentage of applicants are from the remaining countries in the Baltic Sea Region. As a next step companies that have been approved for access and beam time will engage in consultations with the Industrial Liaison Officer at the chosen neutron or synchrotron facility in order to prepare and perform their experiments. 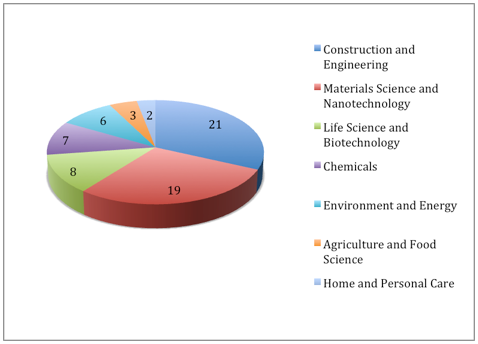 Pie chart Science Link, Number of applications per Industry, 2012-2013, call 1-3. Science Link is a network between leading research facilities of photon and neutron sources and their users. The project aims to support and encourage innovation and entrepreneurship in the Baltic Sea Region. Apart from the research facilities, the network also includes scientific institutes, universities and regional organisations that serve as service and promoting units. Science Link is part-financed by the European Union (Baltic Sea Region program) and involves 17 partners from 8 countries during the project period 2012 to 2014.